Justice League 33 features the conclusion of the Bats Out of Hell story arc, part of the larger Metal crossover series. First and foremost, let me say that I HATE the panels of red writing in a black word balloon. It works adequately when a character is speaking three or four words, but when they are given longer lines I find it just difficult and irritating to read, an often just sort of skip over that dialogue, rather than struggling my way through it. And those kinds of word balloons are used a lot in this story. But that it, honestly, the only real problem I have with this issue. Cyborg is given the starring role, and faces some very tough decisions, centring on trust, and maintaining his identity. 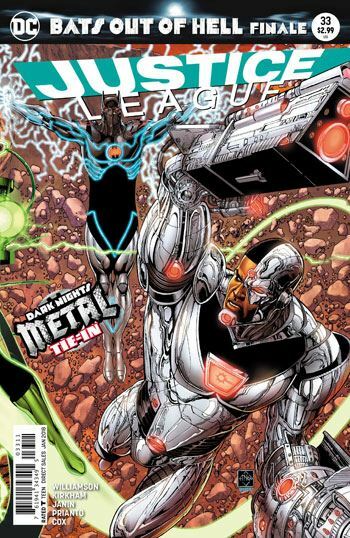 Metal has seen some big changes floated around, and Cyborg is at the core of those right now. How much will he risk of himself? The resolution, and the twist that accompanies it, and both fulfilling. And overall I enjoyed this arc, aside from the red lettering. 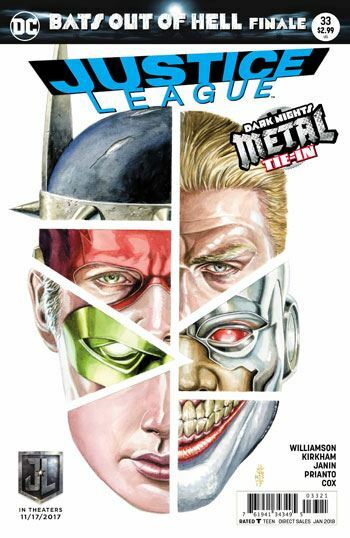 While the main Metal series has me alternately loving and hating what they are doing, the side storylines have been very well crafted to play within the larger arc, and I am tending to enjoy those more.